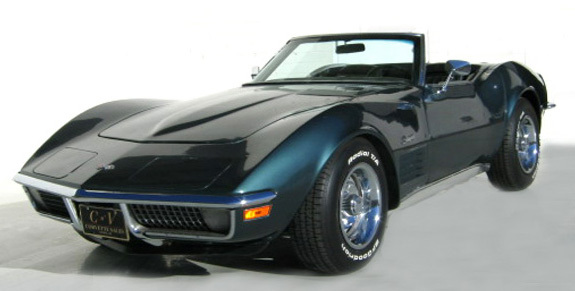 The 1970 Chevrolet Corvette replaced the 4 side gills with an egg-crate vents on the side. The fenders were flared slightly to keep rocks from being kicked up and scratching the paint. The seats were redesigned again, this time to create more headroom. 1970 enlarged the "Big Block" (known as the Rat motor) to its largest displacement at 454 ci. The new option LT1 small block produced 370 bhp. The 350 engine was much lighter than the 454 and provided almost as much power as the lower end "Big Blocks". The RPO ZR1 option included the LT1 engine, M22 (Rock Crusher) transmission, heavy-duty power brakes, transistor ignition, special aluminum radiator, and special springs, shocks, front and rear stabilizer bars and metal fan shrouds. The relatively low production in 1970 was caused by a labor dispute that started in May of 1969. This dispute caused the 1969 production run to be stretched 4 months and the 1970 run to be cut short. Tuxedo Black was no longer available as an exterior color although there were probably a few cars that were painted black as special orders. The body number is the serial number of the body. The trim number represents the color of the interior, the paint color is the exterior paint color. Bore & Stroke 4.00 x 3.48" 4.251 x 4.00" 4.00 x 3.48" 4.251 x 4.00"